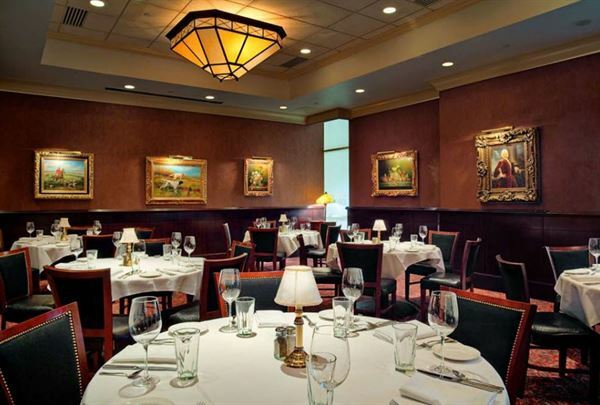 A comfortable room, an elegant table setting, a customized menu with world-class wines, and a dedicated staff providing gracious, anticipatory service - That is the hallmark of exceptional private dining, and precisely what you can expect at The Capital Grille. Your event, whether it’s an intimate party, a lavish reception, or an important business meeting, will be as effortless as it is memorable. What We Offer You • A personal event coordinator. • Customized menus. • Wine pairing guidance. • Complimentary valet parking at most restaurants. • Full complement of media technology, including webcasting through a high-speed internet connection. Appetizers for the Table - Pre-Select One • Pan-Fried Calamari with Hot Cherry Peppers • Cup of Chef’s Seasonal Soup Entrée Choice • The Grille’s Signature Cheeseburger with Parmesan Truffle Fries • Caesar Salad with All-Natural Chicken Breast • Mediterranean Salad with Grilled Shrimp Dessert Choice - Pre-Select • The Capital Grille Dessert Platters • Flourless Chocolate Espresso Cake • Classic Crème BrÛlée Please see attached PDF for more menu samples. Appetizers for the Table • Pan-Fried Calamari with Hot Cherry Peppers • Miniature Lobster and Crab Cakes Salad • Field Greens, Tomatoes, Fresh Herbs Entrée Choice • Filet Mignon 10 oz • Bone-In Kona Crusted Dry Aged NY Strip with Shallot Butter • Seared Citrus Glazed Salmon • All-Natural Herb Grilled Chicken Accompaniments for the Table • Sam’s Mashed Potatoes • Seasonal Fresh Vegetable Dessert Choice- Pre-Select • The Capital Grille Dessert Platters • Flourless Chocolate Espresso Cake • Classic Crème BrÛlée Please see attached PDF for more menu samples.